In addition to my work as a journalist covering the San Diego brewing scene, I proudly act as an ambassador for the region. There are few things as rewarding as exposing people to this county’s exceptional beers and the people behind them. From family and friends to fellow writers and chefs, I’ve shepherded a great many to the craft side, converting them to the good stuff along the way. One person who took to artisanal ale in a big way was Bill Warnke, a kitchen commando I met when working with local chef posse Cooks Confab back in 2009. Cooks Confab was well known in foodie circles for hosting elaborate tasting events focused on individual ingredients such as truffles and foie gras. Seeing the potential for local beer to have a chance to shine — remember, this was way before food and beer were as regularly and rightfully paired as they are nowadays — I suggested the group explore that medium. They snapped the idea up and, a short month later, held what remains one of the biggest and best-executed beer-based chef events in San Diego history. To prepare for the event, I organized tours of breweries including AleSmith, Ballast Point Brewing & Spirits, Port Brewing Company / The Lost Abbey, Stone Brewing Co., and Lightning Brewery. Warnke, a chef with Water’s Fine Catering, was part of the Confab and came along on this sudsy journey. I watched as he and his colleagues had their a-ha moments and gained instant appreciation for craft beer. Warnke, who admits to becoming obsessive when he comes across something he likes, became such a fan that he later soon volunteered to work at Lightning before becoming an investor in the business. He’s since parted ways with the Poway operation, but his passion for beer is still strong, enough so that he’s in the process of opening his own brewery — Bitter Brothers Brewing Company (4170 Morena Boulevard, Bay Park). a Costco and the nation’s largest Harley-Davidson dealership. He’s a fan of the spot because the immediate area is not yet home to a brewing operation, plus there is plenty of on- and off-street parking. That explains the site, but how about the name? According to Warnke, his was a rather terse, not overly expressive, glass-half-empty family. Bitter, if you will. 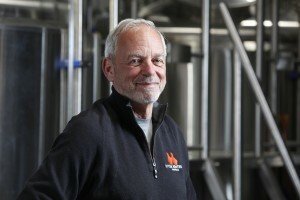 But, it’s in his family tree that one finds Warnke’s brewing heritage. His greatgrandfather was a brewmeister in Germany. Hence, beer had a presence in his household growing up, though it was Stroh’s, and not the kind that brought about inspiration. As for the “brothers” part, multiple current limbs on the family tree will be involved in the company. While Bill will handle the business side, his brother Kurt, a homebrewer of several years, will focus on recipe development and operations. The brothers are bringing in an associate with professional brewing experience to serveas head brewer. Bruce McSurdy, another Lightning alum, will be in charge of Bitter Brothers’ Premier Stainless 15-barrel system, which will be used to produce a number of core beers. As one would expect from a company with the word “bitter” in its moniker, they will offer India pale ales ranging from one that’s a bit more restrained in its hop character, to a full-blown West Coast-style imperial IPA. But the rest of the line-up will be subtler, low-alcohol styles. Warnke is a big amber drinker who enjoyed many a Red Hook ESB back in the day. Expect that style, as well as a pair of traditionally constructed wheat beers in a Belgian-style witbier and hefeweizen. A porter is also in the works. Brothers’ tasting room, much as Green Flash Brewing Company does with their Supper Club affairs. The tasting venue should provide ample space. The rest of the 3,200 square foot facility will be used for production and storage, and there is plenty of room to grow. Maximum annual production is 1,440 barrels (though Warnke’s production goal for Year One is 600 barrels) with enough room to get up to 3,150 barrels with additional fermenters. But first, Bitter Brothers needs to open. Warnke is hoping to be up and running by the first week of November (more commonly known as San Diego Beer Week), and be open for business seven days a week.